Let’s face it, choosing a portrait photographer can be confusing. After all, this is a service that you won’t even be able to see until after it is purchased! To make matters worse, there are literally hundreds of businesses offering portrait photography in WA: A quick search on Google reveals more than 300 portrait photographers! Your portrait photographer needs to have a great portfolio of images that you really like. Talk to your portrait photographer about your favourite images in their portfolio. Every studio also has its own style – for example some only do black and white – make sure it is a style you really like. To make your favourite photos come to life your photographer should be able to offer artwork in a range of sizes and finishes, such as wall art and albums. Producing these products well is quite a skill. What happens if it rains? Your photographer should be able to offer studio photos, complete with professional lighting, as well as outdoor options. Private viewing facilities, including a large screen, are also a must. A great portrait photographer should make you feel relaxed and take the time to get to know you. A good portrait photographer should ask lots of questions about you and what you want. Unlike other studios, we don’t have a high turnover of staff – our photographers are a hand-picked, tight knit team who share common values and approaches to photography. 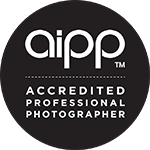 To ensure that your photographer adheres to professional practices, you should only use a studio where the leaders are accredited members of the Australian Institute of Professional Photography (AIPP). This ensures that your photographer is deemed a professional by his or her peers and adheres to a code of ethics and professional practices. At Cooper Studio we believe that we tick all of the above boxes. We’re always happy to meet you before your shoot and we’re really interested in what makes you tick, and how your photos can capture your true essence!